These days my head is full of formulas, variables, and equations. My oldest is in high school now, so I’m officially engrossed in upper level math. Since I’m the one teaching the math lessons, I have to take time to make sure I completely understand the mathematical concepts I’m teaching. It’s been a long time since I’ve had to do high school math, so I sometimes need a refresher on a particular concept. That’s when I turn to YouTube for math tutorials. These videos help jog my memory and sometimes show me a new and better way of teaching a specific concept. Let me tell you. Some of these Youtube math masters teach better than I do. Do I get mad? Give in to self doubt? Nah. I just thank God for the gift of YouTube and call for my daughter. She sits down, watches the explanation, talks with me about it, and goes off to do the lesson in her math book. That’s a win for both of us. Yes, YouTube is great, but there are hundreds of math channels there. It’s hard to sort through them all. Which channels are watch worthy? Check out my list of favorites and subscribe. Khan Academy: Khan Academy is the go to website for all things math related. Sal’s detailed videos have helped my daughter and me better understand many different mathematical concepts. Tarver Academy: This channel is informative and entertaining. Tyler Tarver’s videos are practical, pointed, and amusing. He’s helped us better understand many math topics. At first, I just watched videos to learn more about math, but now I also tune in to see what’s going on with Tyler’s adorable family. MathAntics:The more intricate concepts of math are built upon basic principles. Every now and then my daughter needs to review one of these basic concepts. MathAntics is the perfect website for review. We both love these informative and entertaining videos. Professor Leonard: Professor Leonard is the Superman of Math. I love his enthusiastic and detailed approach to math instruction. He does a great job of taking complicated concepts and breaking them down into easy to understand steps. I love that he provides lots of examples as well. Check out his playlists for specific topics such as Calculus, Statistics, and Algebra. MathTutorDVD: I discovered this channel last school year have used it often. The channel features full length lessons in Prealgebra, Algebra, Calculus, and Trignometry. 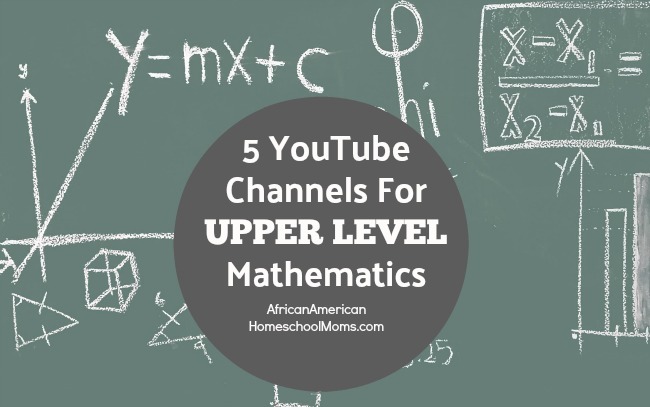 If you’re teaching upper level math, you’ll want to subscribe to this channel. Teaching math can be challenging, but YouTube videos make it easier for moms and kids to understand concepts. Are you teaching upper level math this year? Are there any YouTube channels you’d recommend? If so, PLEASE leave a comment below. My YouTube account always has room for another channel!